IGR Leakage Current Analyzer is invented as the world first, and also can measure Insulation Resistance (MΩ) without power cut-off. This patented instrument can analyze leakage current, and display Igr(resistive), Igc(capacitive), and Io(vector sum), Ground Insulation Resistance, and the phase angle between voltage and current. - Operates due to Io. 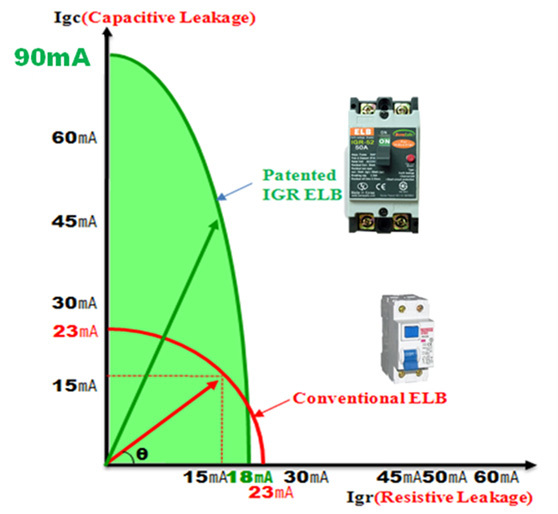 - Sensitive leakage current is too high for people. - Impossible to lower Igr because of its sensitivity. - Operates due to Igr. - Possible to go down Igr for safety of people and animals. - Possible to manufacture high sensitive ELB. - Possible to prevent fire from electric leakage current. The IGR breaker can cover 20 PCs sets, but conventional(Io) breaker can cover only 10 PCs sets per one breaker because of residual capacitance leakage current.